Posted on August 21, 2018 by Wise Eats. Well, we just got done working out, which means it’s the tastiest part of the day. Fuel your muscles and satisfy your cravings with this delicious workout smoothie. Chocolate is now a part of a healthy, balanced diet thanks to the Wise Eats Muscle Milk. Train, say your prayers, and take your vitamins with Wise Eats. More wrestling-inspired recipes and training routines at Wise-Eats.com. 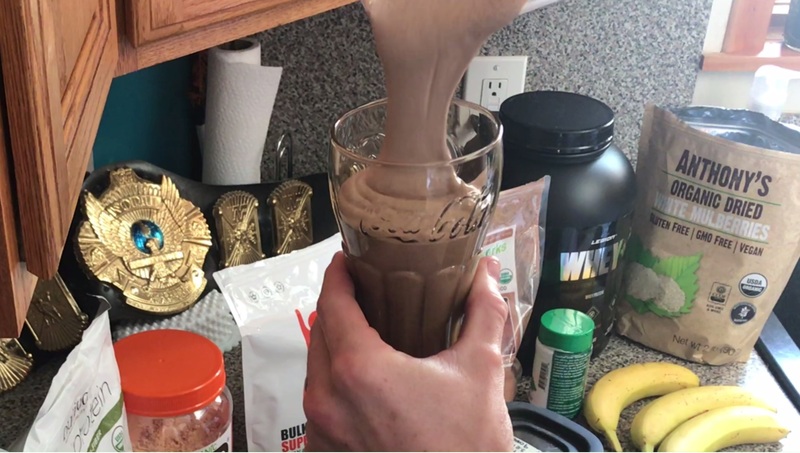 Forget the store-bought muscle milk which is loaded with artificial ingredients, low-quality protein, and other chemicals. This homemade smoothie is short on ingredients and stocked up on nutrition. It is low-fat, high protein, high carb, which is exactly what you want in a pre or post workout. I have a smoothie like this almost every day. There’s nothing like it after a hard workout. Smooth, creamy, delicious, and exactly what your muscles need after they’ve been pushed to the limit. Start with two scoops of whey protein isolate, about 50g. I use naturally sweetened, grass fed chocolate protein. Whey protein is fantastic for losing body fat and/or building muscle. If you’re not getting enough protein in your diet, it’s time to Wise Up! Frozen banana adds amazing texture along with some healthy carbs, vitamins and minerals. I prefer to use homemade cashew milk, but rice milk, coconut water, and almond milk are great options as well. Cinnamon is anti-inflammatory and contains other antioxidants. Stevia is a natural sweetener that has zero calories and offers some health benefits. Mulberries add more vitamins, minerals, and a great crunchy texture to the smoothie. Blended together, it’s an amazingly tasty and healthy treat that’s going to help keep your health on track. Fuel your body the right way with Wise Eats. If you’re drinking that store-bought muscle milk, WAKE UP JACK! Get in the kitchen and make a wise decision. Real food. Real results.